Whether you groom or brush often depends on the length of your cat or kitten's coat. Everyone has their own favourite choice of brush or comb and there are thousands on the market in all shapes and sizes. There's also a wide range of other products such as rakes, mitts and grooming cloths. 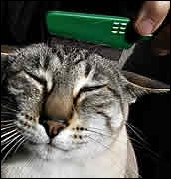 Some cats enjoy being brushed or combed while others resist it with a vengeance. However, you should make the effort to comb your cat or kitten at least once a week as the hair you remove helps control hairballs and shedding, as well as reducing the amount of cat hair around your home and on your furniture. better - this will allow your pet to become familiar with the implement you use in its early life. You should sart the process by combing around at the back and neck. If your cat resists by hissing and clawing you should stop the procedure and talk calmly to your pet. If grooming is proving particularly difficult you may wish to seek the assistance of a friend or relative who is willing to hold your cat or kitten for you. You could also consider giving your cat or kitten, a tasty treat after a successful brushing or combing session, so it associates the reward with its behavior. Some cats enjoy eating while they are being brushed or combed and the food can act as a distraction. It's important to have a flea comb as an accessory - not only does this enable you to check for fleas, but also for dead hair, scabs and scales. And the fine teeth, all flea combs are excellent for removing stray hairs normally missed by standard combs or brushes. Mats are batches of loose hair that get tangled into hair which is still growing - and as any cat owner will know, they continue to grow until they pinch and pull on your cat's skin. The key to reducing the problem of matting is regular brushing and combing which allows you to prevent mats developing to an unmanageable size. Cats with medium to long coats are the most susceptible to matting and areas particularly prone to mats are behind the ears, under the tail, behind the legs, the armpits and abdomen. Shorthaired cats don't suffer nearly as much with grooming but when they do they are normally located at the base of the spine and tail where cats have difficulty grooming themselves. Some cat owners resort to using scissors to remove mats but this is not the right way to tackle the problem. First you should try combing the mat out with a course metal comb, starting at the mat's edge and working in towards the skin. You can use your fingers to break up the hairs if you are struggling with a comb. Next you should work the comb between the mat and skin amd then cut the hair along the comb on the side which is away from the skin to avoid cutting any flesh. Finally you should comb out any remaining shorter hairs. The hair can take quite a while to grow back and skin below a mat can be inflamed due to the irritation caused by moisture and trapped dirt. Some cats find the de-matting procedure quite stressful and disturbing due to pulling which is sometimes unavoidable. You may need to seek assistance from a friend and if you find the problem too difficult to deal with it may be necessary to seek the services of a professional pet groomer. Shaving is often a good way to resolve matting problems - it may cause some discomfort but not as much as combing if the there is significant matting. In extreme cases of matting it may be necessary to sedate a cat to avoid injury to either the animal or the groomer. Grooming is a very extensive subject and cat owners are always developing their skills. But thankfully there's a wealth of help at hand - their are plenty of websites like this one offering advice, as well as many good books on the subject and plenty of tools and accessories on the market to help with the grooming process.